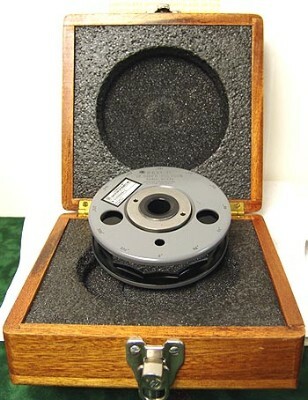 The Davidson Optronics D633-12 Optical Polygon is made of fused Quartz and is used as a Precision Master Reference for calibration of Rotary Tables, Potentiometers, and Resolvers. Having 12 faces, each face is 7/8" tall by 1-1/16" wide, 30 degrees apart and Aluminized and Coated. This makes the individual faces large enough to easily use for autocollimation. The Certified minimum accuracy of this is +/- 5 seconds of arc, but since the calibration sheet is not present, could well be one of the 1 arc second models. This comes in its factory mahogany case and is in excellent condition.